These are ORIGINAL LICENSED Designs Made By Esti’s Baby Couture and does not infringe on any rights holders rights. The words used in the title and/or search terms are not intended to imply they are licensed by any rights holders. Printed with Pride in the USA. Our Funny Onesie Unisex Dress Up Body suits are High Quality Presents you wont forget . Please choose your Size and/or Color from the drop down menu above if applicable. 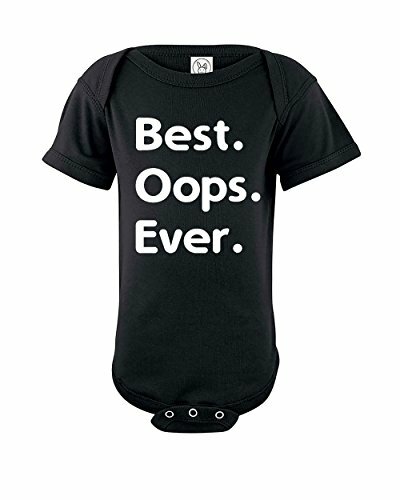 Impress your friends with this unique Funny “Best OOPS Ever” Baby or other Esti’s Baby Couture products, Sure to standout. All our Esti’s Baby Couture designs are printed on a high-quality Premium Baby Onesies, Soft cotton, fitted, short sleeve or long bodysuit, featuring a “Best OOPS Ever” Unique design on the front. These unique Baby onesies are designed and printed in the USA with eco-friendly ink-so it is safe for you and the environment. This durable, comfortable Baby Body Suits is sure to be a hit, whether you’re buying it as a gift for somebody special or for your future Babies.